Hunting World is a global corporation; they are one of the leaders in the leather fashion industry and a very well known brand amongst celebrities. Hunting World has been dedicated to designing the highest quality products. Their team shares a dedication to conservation, exploration and education. The company’s philosophy is best expressed by their logo, the tusk less baby elephant, a symbol of rebirth and renewal. 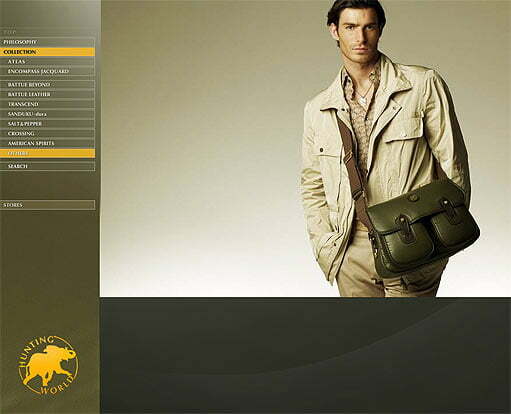 Hunting World has taken the designs of Bob Lee’s safari gear and modified them to meet the needs of the urban jungle. From handbags and travel cases to carry-alls and waist packs, Hunting World helps keep the Adventure Alive. Hunting World has factories, partners and stores across the world, managing sales and coordinating production across 12 time zones is something that can only be imagined. Hunting World needed a system that connected disjoint systems that were not only using different architectures but also different languages. The challenge was to understand how the huge multi dimensional organization functioned and to automate every possible function to achieve organizational goals towards efficiency and accountability. Although several software solutions were in use, both custom and out of the box the need of the hour was a web based information portal that was designed from ground up to encompass all of the functions required. A custom ERP solution that links continents for a fashion icon. Pulse information architects worked closely with senior management to build an online management portal that included over 180 individual systems and utilities to help manage all operations of the Hunting World Global Enterprise. The system consists of modules plugged together; each module is independent in terms of database connections with a separate business logic layer, this architecture was perfect as the system was constantly being enhanced to achieve new levels of productivity and things needed to be “pluggable”. The software was written over a period of 3 years to accomplish several times the initial scope of work, the system now runs all aspects of the Hunting World corporation exactly how the senior management wants, the system is not only stable it is easy to maintain and upgrade due to the pluggable architecture devised by Pulse engineers at the onset. The ordering process at Hunting World is unique amongst all manufacturing companies as fashion related goods need perfect timing as well as logistics planning before the goods are sent for production. IN addition to the automation suite, the sales forcasting, cataloging and scheduled reporting services make the system an essential part of Hunting World Operations today. The immediate result of the system being deployed was a phenomenal increase in efficiency on all aspects of the order processing operation. The management is able to make instant decisions about production and order processing as all of the information is readily available. The disjoint operations are now unified into a single online system which is accessible from anywhere in the world offering new levels of scalability and accessibility. Overall the system has already saved millions of dollars in lost productivity. Due to the extensible architecture the system is evolving into new avenues of Hunting World Business giving the company an edge in a highly competitive market.